The public sees widespread discrimination against several racial, ethnic and religious groups in the U.S. And while most of these views are little changed over the last several years, the share of Americans saying Jews face discrimination in the U.S. has increased substantially since late 2016. 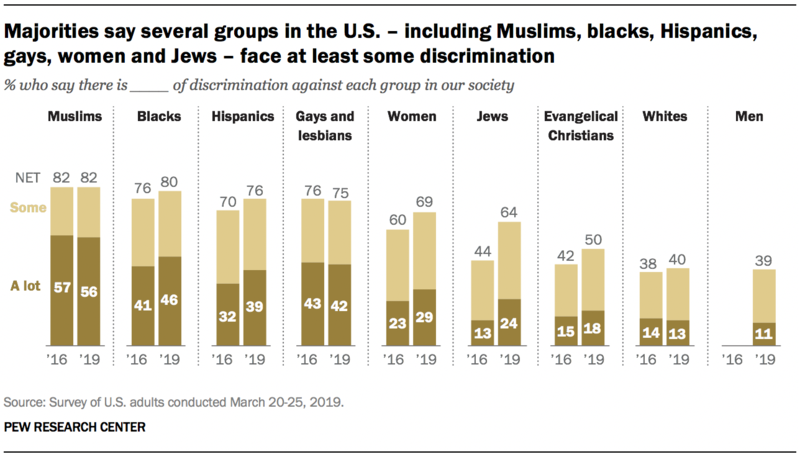 Today, 64% of Americans say Jews face at least some discrimination – a 20-percentage-point increase from 2016; the share saying Jews face “a lot” of discrimination has nearly doubled, from 13% to 24%. Democrats remain more likely than Republicans to say there is discrimination against Jews, but the shift in these views is evident in both parties. The survey by Pew Research Center, conducted March 20-25 among 1,503 adults, also finds majorities continue to say there is a lot or some discrimination against Muslims, blacks, Hispanics, gays and lesbians, and women. Muslims, in particular, are seen as facing more discrimination than other groups in society; 82% say Muslims face some discrimination, with 56% saying they encounter a lot of discrimination – highest among nine groups included in the survey. While overall views about discrimination against most groups in U.S. society are little changed since 2016, already wide partisan divides in many of these views have grown wider. For example, in December 2016, 57% of Democrats and Democratic leaners, compared with 20% of Republicans and Republican leaners said that blacks faced a lot of discrimination – a 37-percentage-point gap. That has increased to 50 percentage points in the current survey: 69% of Democrats now say blacks face a lot of discrimination, compared with 19% of Republicans. Majorities in both partisan groups say there is at least some discrimination against many groups, including Muslims, blacks, gays and lesbians, and Hispanics. 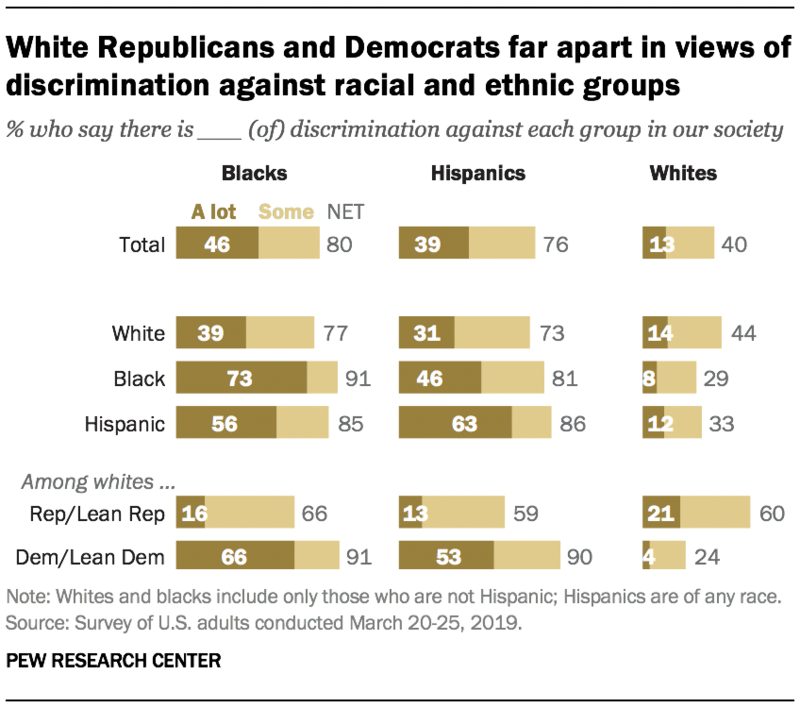 But the share of Democrats who say each of these groups face discrimination is significantly higher than the share of Republicans who say the same. For instance, 92% of Democrats, compared with 69% of Republicans, say Muslims face at least some discrimination. In contrast, Republicans are about twice as likely as Democrats to say that evangelical Christians (70% vs. 32%), whites (58% vs. 25%) and men (48% vs. 27%) are subject to at least some discrimination. Partisan differences in views of how much discrimination several groups experience have widened in recent years. Democrats have consistently been more likely than Republicans to say most groups face a lot of discrimination. Since 2016, however, the share of Democrats who say blacks face a lot of discrimination has increased, while Republicans’ views are little changed. Since 2016, there also have been sizable increases in the shares of Democrats who perceive a lot of discrimination against Hispanics (14 percentage points) and women (11 points). 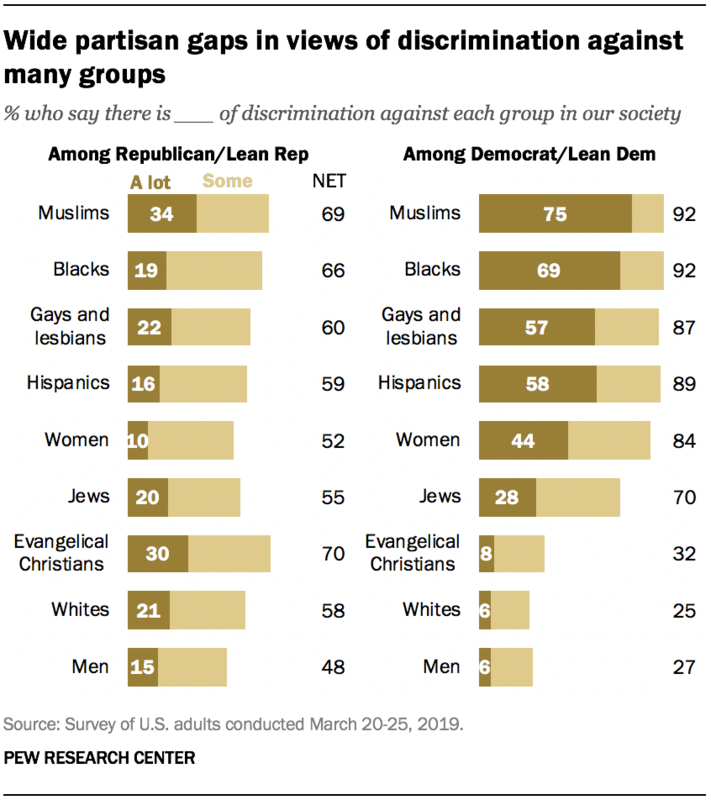 There also is a wider partisan divide in views of whether evangelical Christians face a lot of discrimination. Currently, just 8% of Democrats say this, little changed from December 2016. By comparison, 30% of Republicans hold this view, up from 21% in 2016. The partisan gap in views about discrimination against whites is little changed from 2016; Republicans remain more likely than Democrats to say there is a lot of discrimination against whites (21% vs. 6%). Among members of both parties, the shares saying there is a lot of discrimination against Jews has roughly doubled since 2016 – from 15% to 28% among Democrats and from 9% to 20% among Republicans. Overall, whites are less likely than blacks to say that blacks face at least some discrimination (77% vs. 91%). Among whites, there is a wide partisan gap in views of discrimination against blacks (91% of white Democrats and Democratic leaners say there is at least some discrimination against blacks in our society, compared with 66% of white Republicans). A similar pattern is seen for Hispanics. Whites overall are less likely to say that Hispanics face discrimination (73% of whites say this, compared with 86% of Hispanics). However, 90% of white Democrats say that Hispanics face at least some discrimination compared with 59% of white Republicans. When asked about discrimination against whites, whites are more likely than blacks or Hispanics to say that there is at least some discrimination against whites in the U.S. (44% of whites say this compared to 29% of blacks and 33% of Hispanics). Yet while 60% of white Republicans say society discriminates against whites, only 24% of white Democrats share this view. While majorities of both men and women say there is at least some discrimination against women, this view is more widely held among women (76%) than it is among men (62%). Both men and women are substantially less likely to see discrimination against men. Men are slightly more likely than women to say there is a lot or some discrimination against men (43% of men, 36% of women). Within partisan groups there are no gender gaps in views about discrimination against men: About half of Republican men (51%) and a similar share of GOP women (44%) say that there is at least some discrimination against men. Both Democratic men (29%) and Democratic women (26%) are much less likely say this. 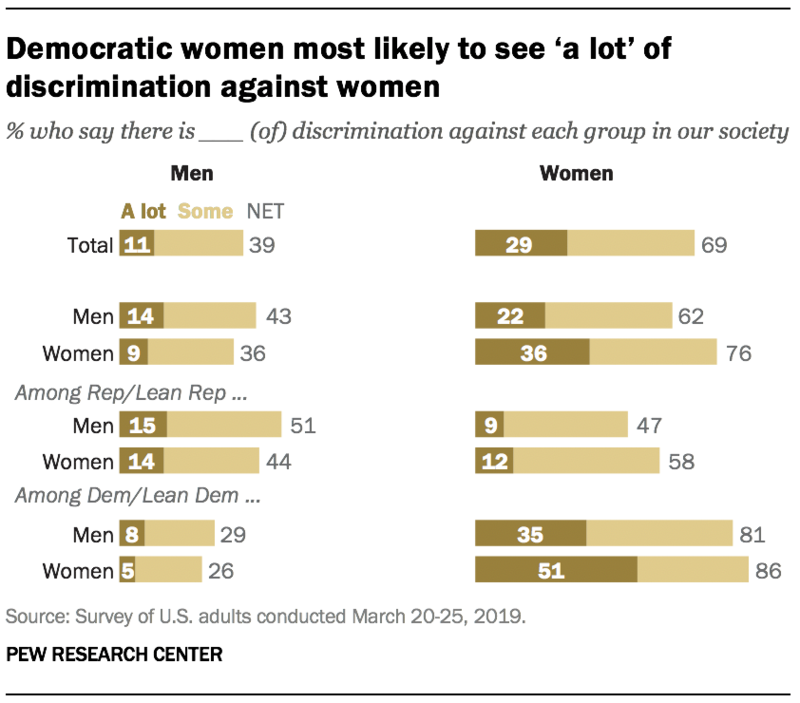 In views of discrimination against women, fairly comparable shares of Republican women (58%) and men (47%) say women face at least some discrimination. Democrats – both women (86%) and men (81%) – are far more likely than Republicans to see discrimination against women. However, a greater share of Democratic women (51%) than Democratic men (35%) say women face “a lot” of discrimination in our society.